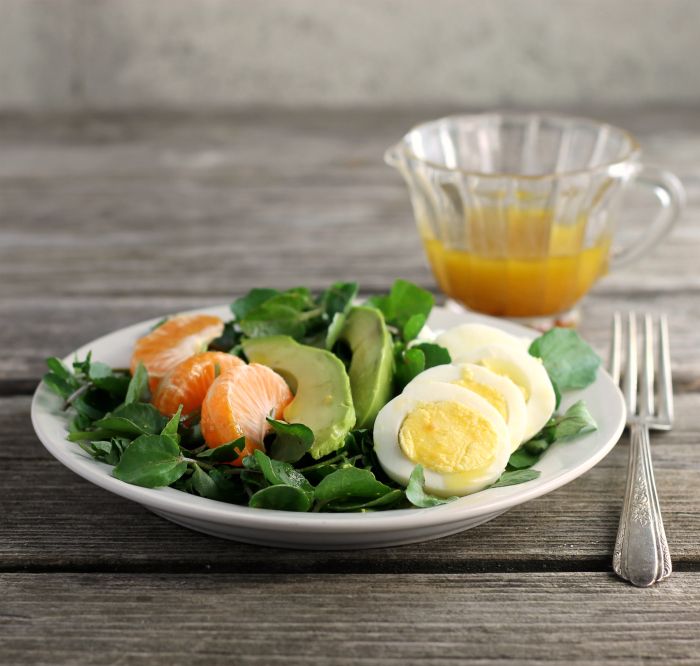 Are you looking for a simple salad that is healthy and delicious? This watercress salad with vinaigrette is all that and more. We live way out in the country. Yeah, we live in a quiet little valley; it’s a peaceful place to live. There is beauty all around us; I really love where we live. I grew up out in the country, so I feel at home here. There is a creek that runs through the valley, not too far from where we live. We go walking past the creek on our walks during the warm weather. There is wild watercress that grows by the creek. Every year I think about picking some to eat, but it never happens, until this year. It has only been like 19 years since we have lived in this spot, so it is sad that I haven’t taken advantage of it. I remember when we were going to purchase the land where we built our home, the man that sold the lot to us, brought us some watercress soup. It was delicious. I have always wanted to ask him for the recipe, but for some reason have never asked him for it. This spring we have been walking past the watercress going on our evening walks and decided that this was the year that I was finally going to make something with the watercress. I decided on a simple salad, to start thing off with. 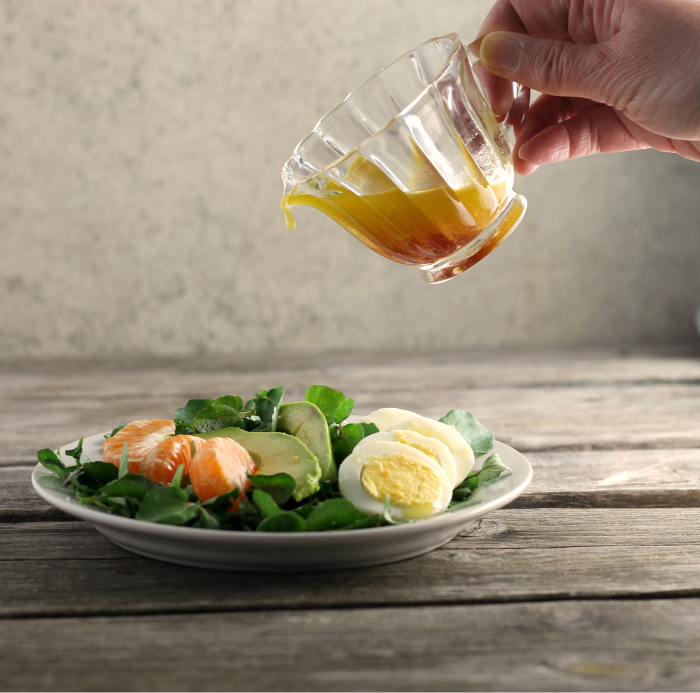 After doing some research on watercress salads, I decided to go with a simple vinaigrette for the dressing. 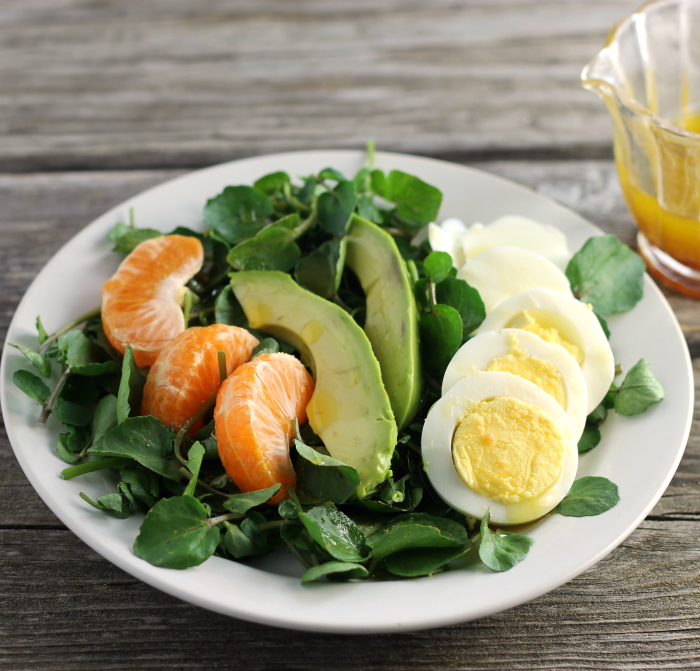 The peppery flavor of the watercress went nicely with the clementine, avocado, and hard-boiled egg. As I mentioned earlier in this post the salad was served with a simple vinaigrette, made with red wine vinegar, soy sauce, sugar, garlic, and olive oil. I normally try to have some kind of leaf lettuce salad in the evening with dinner; the watercress salad with the simple vinaigrette was a nice change. Even Mike who I can never get to eat salads ate and enjoyed this one. Looking for a change to your leaf lettuce salads? Try this watercress salad, you don’t have to use wild watercress as I did you can buy it in the grocery store. Wash and dry the watercress. Trim the stems and discard. Slice the avocado into thin slices. Slice the hard-boiled egg, Peel the clementine and break into sections. Arrange the watercress on a couple of plates. 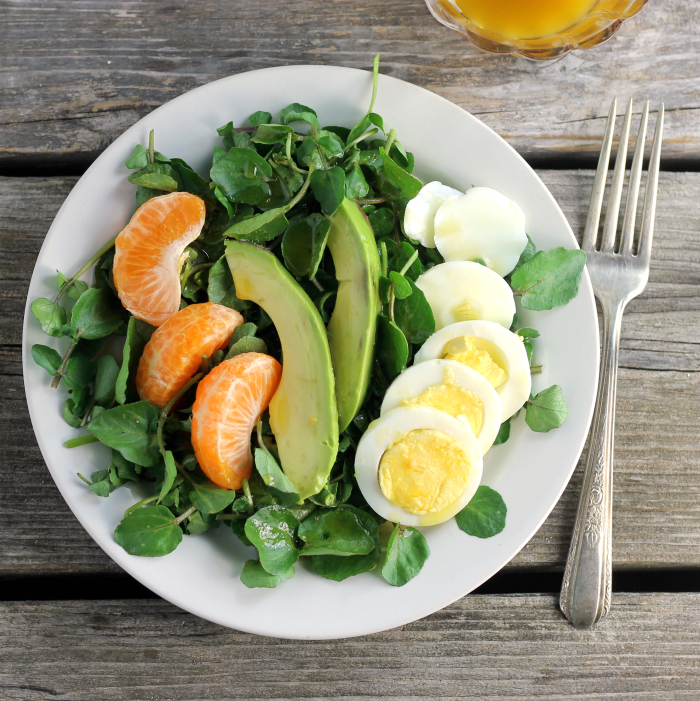 Top the watercress with the avocado, hard-boiled egg, and clementine sections. Mix together the minced garlic, red wine vinegar, soy sauce, and sugar. Slowly pour the olive oil into the mixture, whisking as you pour the oil in. Store the watercress in the refrigerator along with the dressing. 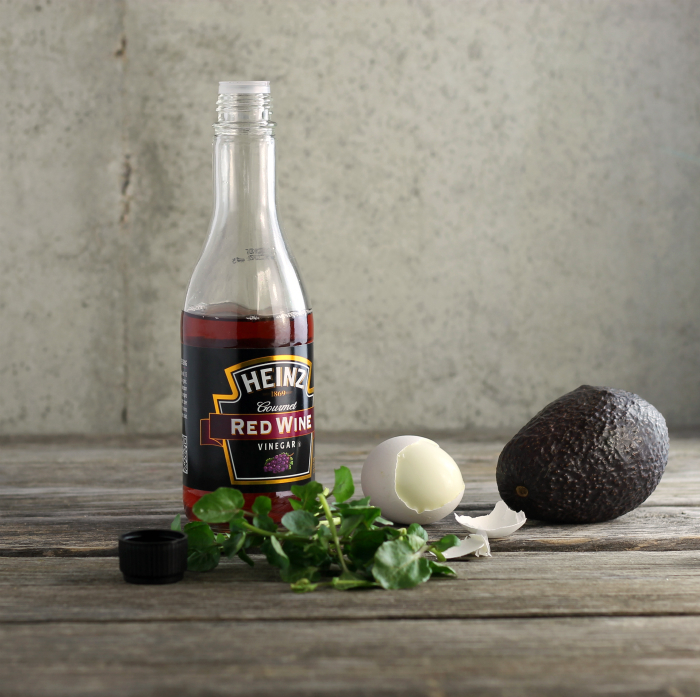 Seasonal, delicious and nutritious…exactly my kind of salad, Dawn. What a fun story behind this salad, Dawn! I’ve never even heard of watercress growing in the wild. Truth be told, I have a secret dream where I discover a wild patch of blackberries. My grandma had wild blackberries growing on her farm when I was a kid, and I’d love to recreate those memories! Oh, and then there’s the ramps. I’m determined to find wild ramps around here…but so far, no luck. I’ve even drug Laura out on my ramp huntin’ adventures! Anyways, this salad sounds perfect. Delicious and easy! I’ve only had watercress once or twice before! How wonderful that you have it growing wild! Your salad looks absolutely delicious! I love the toppings. Simple. Fresh. Delicious. Perfect. My kind of salad! Never tried it but I love, love, love your photos here.